Thinking of traveling or planning a trip, but not sure how or where to find the best travel packages and deals to save money. Luckily for you, it’s now easier than ever thanks to discount travel sites. You no longer do you need to get a travel agent to help you compare travel prices and find the best deals. Travel websites are now a go-to source for travelers when booking trips. Travelers are able to find large discounts, travel guides, and price guarantees simply by using travel sites. 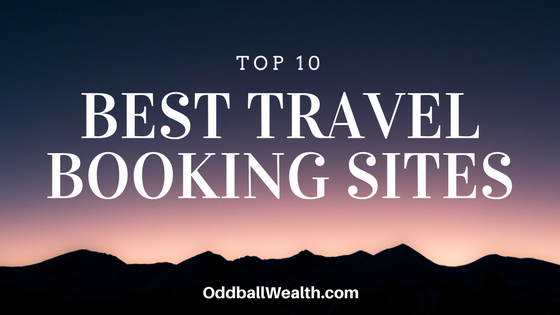 A traveler might use multiple travel sites to search and find the best deal, or they may like and use a single site to book all of their trips and travels. The best for personal and business travelers, with any type of budget. Their easy to navigate and informative website, allows anyone to quickly find, make reservations, and enjoy staying at the best places available — all while guaranteeing the best prices available! Booking.com is far the worldwide leader for online travel websites and finding the best deals possible when booking trips and vacations. The proof is in the number of customers and users which use the website — more than 1.2 million rooms are reserved each and every day through booking.com. The website is used every day by both business professionals and regular individuals for personal pleasure. It was first established in 1996, and is part of The Priceline Group. One of the reasons for the websites long-term success and for continually dominating the market each year, is because Booking.com guarantees the lowest prices possible on every type of property accondmentation — from small to large properties, to family oriented bed and breakfast, to five-star suites, to top-of-the-line executive condominiums and apartments. Also, booking.com is available in 225 plus countries, has almost 1.2 million active properties to offer, and is available in more than forty languages! Priceline has a nifty little feature that works amazingly well for getting last minute deals, called the Name Your Own Price tool — which allows you to bid on hotel rooms, properties, flights, rental cars, and more! Priceline also offers extremely good deals on limited of time offers, which you can also grab to cash in on savings. Priceline — an all-in-one trip and vacation planner and Booker. Priceline offers unique deals and travel discounts on flights, hotels, car rentals, vacation packages, and more! CheapOair – a user-friendly trip and vacation planner, that acts like a travel search engine for flights, car rentals, hotels, and deals on travel packages. The site compares prices and costs from multiple companies to find you the very best deal. Jetsetter – a cool website that gives you insider access to information on amazing travel deals and once-in-a-lifetime experiences. They consult with more than 200 journalists from world-class publications, who give them information on the very best hotels. Accorhotels.com – The world’s largest hotel manager and market leader over in Europe. With More than 3,500 hotels to choose from in more than 92 countries, on all budgets from luxury to thrifty. TripAdvisor – this is a very useful website for finding and reading reviews. They have 250 million plus reviews on more than 5.2 million restaurants, attractions and other destinations around the world. TripAdvisor also gathers information from hundreds of other sites to show the best available prices on hotels. LookUpFare – an online travel site motivated to revolutionize the industry and make it affordable for everyone. The site works with a number of trusted travel brands in order to offer users thousands of new flight deals every day, ensuring the lowest prices available. Travelocity – is a one-stop shop for anyone who wants to travel.